Come and stay at this coastal kiwiana holiday home in scenic Pukerua Bay and discover the beautiful Escarpment Track to Paekakariki, part of the famous Te Araroa Trail. Pukerua bay has an expanse of beautiful rock pools and soft sand to relax and enjoy. Kapiti Outlook is just 35 minutes’ drive north of Wellington and only a 10minute drive from the thriving town of Paraparaumu which is well catered for with a range of cafes, restaurants and children’s playgrounds. Come and relax in the sanctuary of this stunning self-contained holiday home. 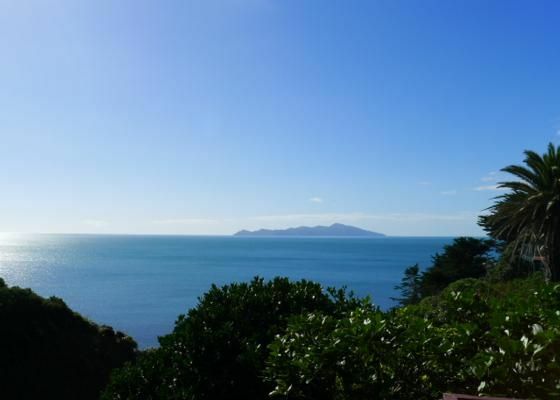 This beach house is in an idyllic setting, elevated for uninterrupted views of Kapiti Island. Open plan lounge and dining room. This house is full of character, homeliness and nostalgia of kiwi summers past. Perfect for families to enjoy a classic kiwi summer. The section is safe for children with large outdoor areas and a great deck. . Best of all are the beautiful views, fabulous sunsets, and a wonderful beach. Come and relax enjoy the truly magical sunsets over the sea. Relax in the ambience of this idyllic setting and enjoy all it has to offer….. Some other local attractions in Paraparaumu include NZ’s No 1 Golf Course, Southwards Car Museum, Ten Pin Bowling, Nga Manu Bird Sanctuary, Coastlands Aquatic Centre and Kapiti Island Tours just to name a few.